Best-selling urban-fantasy author John G. Hartness returns with “Raising Hell” – the first book in his brand new, much-anticipated “Quincy Harker, Demon Hunter” series. Set in contemporary Charlotte, North Carolina (Hartness’ own hometown), the series follows the demon-hunting adventures – and misadventures – of Quincy Harker, the immortal wizard and professional exorcist, who armed with more than a century of wisdom, the gift of “second sight,” a sharp wit, sharper tongue, and the fact that his uncle just so happens to be the legendary Count Vlad Dracula, sets out to make the world a better place, one exorcism at a time. Quincy Harker isn’t your prototypical hero, however, he’s a foul-mouthed, irreverent, overly chatty, self-admitted jerk with enough snark and attitude to last a few more centuries at least. While the series draws many parallels to DC/Vertigo Comics’ “Hellblazer” series, Quincy Harker comes across as just akin to Marvel‘s Deadpool as he does John Constantine. “Raising Hell” doesn’t waste any time getting right to the action, opening with Harker showing up to an appointment in the suburbs to take care of a routine exorcism of a young girl who was possessed by a vicious demon. Though not shy about the fact that he is upset to be missing a playoff game of his favorite football team (Charlotte’s own Carolina Panthers, of course), he quickly goes to work, utilizing his “second sight” skill to scan the area, and ultimately to meet the demon face-to-face in the otherwise unremarkable house. As luck would have it, this proves to be anything but a routine exorcism, as things go bad from the very start, leading Harker into a whirlwind of chaos as he attempts to track down and take out an ancient and powerful wizard, and all of the demons he’s bringing with him. Along the way, he calls on many of his allies, from his own Guardian Angel: Glory (complete with a hilarious, fourth-wall-shattering nod to its source material), his Uncle Luke (better known as Count Dracula), and The US Department of Homeland Security, to name a few. There is much, much more than that, but I won’t go into any more of the plot. I will say that the book closes with plenty of room to continue the series, but beyond that, the only other thing I’ll say is go pick it up and read it for yourself to find out what happens! While Hartness is certainly no stranger to writing exciting, enjoyable, and successful works of dark fantasy – particularity with his highly-popular “Black Knight Chronicles” and “Bubba the Monster Hunter” series, which are available everywhere now – Hartness has seemingly found a new level of excellence here with this latest series. For my money, “Raising Hell” seems like the best possible culmination of all of Hartness‘ previous works, blending together familiar elements of each of them alongside the author’s signature style of unapologetic, irreverent dark humor and sharp wit, while forging a totally new identity and finding that perfect blend of all the right ingredients to create something that, perhaps above all else, is just plain fun to read. 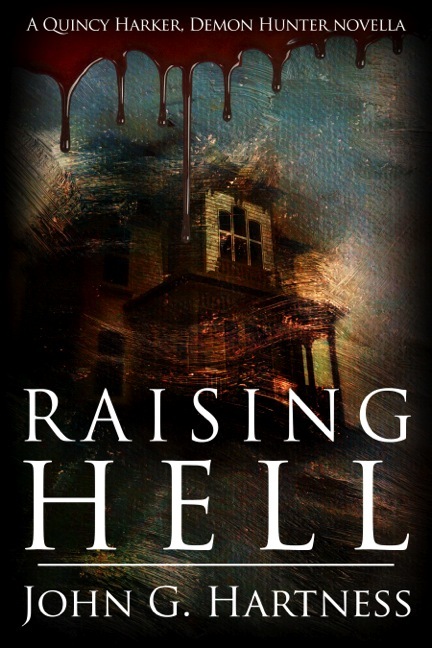 “Raising Hell” is currently available for pre-order through publisher Falstaff Books, with a 90-day Amazon exclusive eBook release beginning January 20, 2015, and available in all eBook formats, as well as in print at conventions and select bookstores this spring after the 90 day exclusive expires. You can pre-order “Raising Hell” HERE – and find more information at the author’s official website.